For Dave and Jeannie Schwab, the effort of cleaning and applying shake oil to their massive real cedar shake roof every five years or so eventually wore them down. They loved the look of shake on their home, but hated the maintenance aspects. 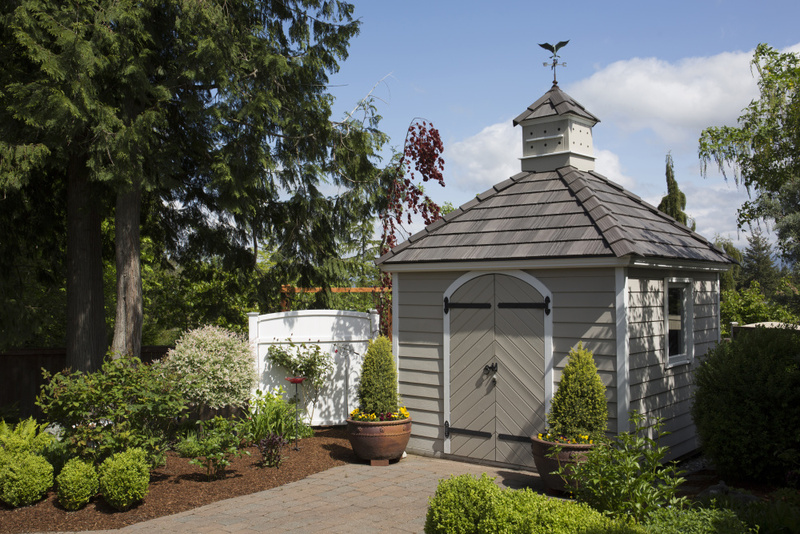 So they shopped for a new composite shake for their home and matching potting shed — and decided on DaVinci Multi-Width Shake roofing in a Mountain blend. "Our home was built in 1993 and there's a lot of roofing involved in its design. Eventually the roof really needed to be replaced. We liked how the natural cedar roofing looked on the house, but when we went shopping for a new roof we wanted a cedar shake alternative." 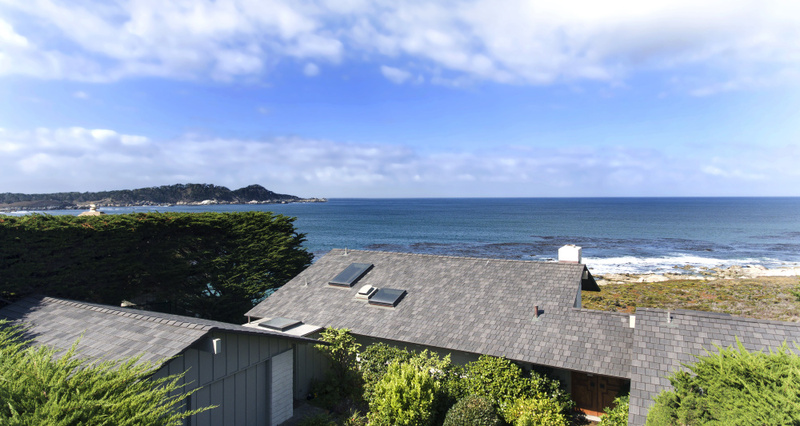 Most people would be envious of Robbin Torrey's home with sweeping Pacific Coast ocean views. The one blemish in her ideal home … the original 51-year-old redwood shake tiles that were falling offer her roof. After doing her research, Torrey replaced her deteriorating roof with Multi-Width Shake from DaVinci Roofscapes in a Mountain blend color. "The DaVinci roofing material was of the best quality of all the products I reviewed. I liked the durability and appearance of the shake. Since my house is right on the coast, the fact that this synthetic shake tile has a wind resistance of 110 mph was very important to me." When it came time to move from San Francisco to Pebble Beach, California, the Hines family fell in love with an abandoned 31-year-old home. It needed many replacements, including a new roof. They listened to their roofer, Denison Roofing, and selected an energy-efficient EcoBlend roof from DaVinci Roofscapes in Castle Gray-EcoBlend color. The roof meets Title 24 requirements, is ENERGY STAR® rated and meets the approval of the Cool Roof Rating Council to reflect sunlight and heat away from the home. "The old cedar shingles were in terrible shape. They were turned up like potato chips, falling off and rotting. We're glad we listened to our roofer. They did a terrific job and we love the new roof. Many of our neighbors have complemented it and we'd strongly recommend this good-looking, hard-working roofing product!" Everyone knows the saying "Everything is Bigger in Texas" … and the sprawling home of Jason Taylor is no exception. 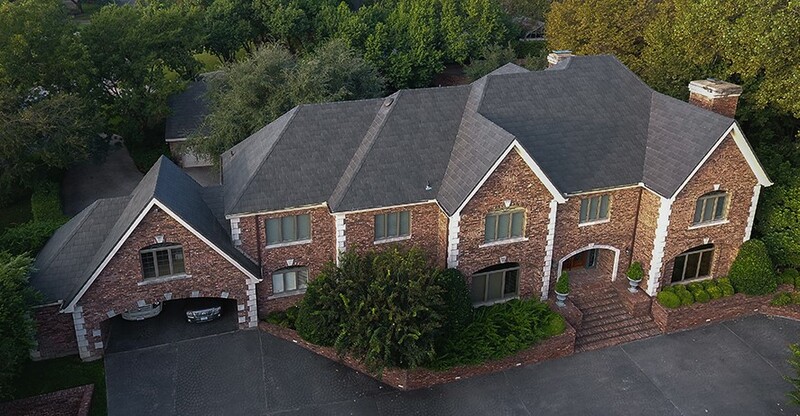 To complement his massive brick home and carport area, Taylor selected Bellaforté Slate roofing from DaVinci Roofscapes in Slate Gray. "I liked the look and durability of the DaVinci product. The installer did a great job on the roof. If I had family members or friends looking for a new roof I'd highly recommend this roof and Huf Construction." Fire. A homeowner's worst nightmare. It happened recently to the Matthews family when a chimney fire caused by hot embers and ash that got through the spark arrestor and ignited the dry, combustible cedar shake roofing at the top of the chimney. Quick response by the fire department limited the damage, but a new roof was needed. 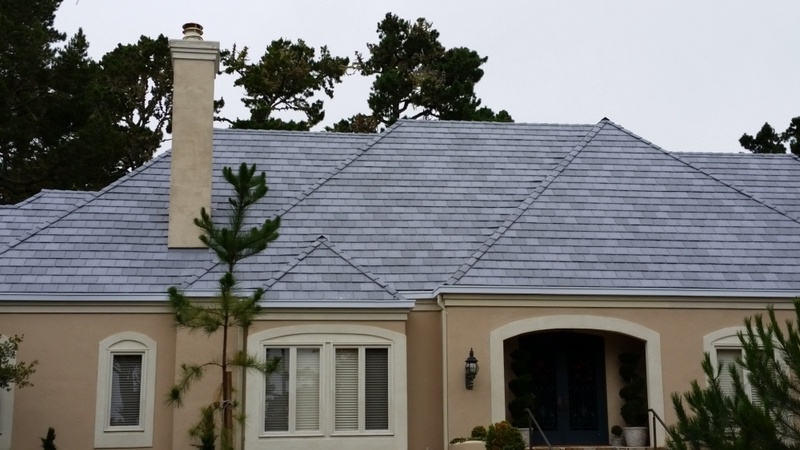 The family chose a fire-resistant Bellaforté Shake roof from DaVinci Roofscapes in a Mountain VariBlend color. "The lifetime limited warranty on the product plus the Class A Fire Rating are 90% of the reason behind our DaVinci selection. This synthetic shake roofing actually looks BETTER than real shake tiles. All of my neighbors were very anxious to see the finished roof and they have nothing but positive comments about it. I believe we'll see many more of these DaVinci roofs in our neighborhood in the coming years."